Tom Cruise soars as a slightly naive reliable, innovative air delivery gringo splitting his loyalty and association not necessarily mutually with the CIA, USA, Central American cartels, White House, DEA, FBI, and additional 'covert' missions that transport cocaine, weapons, illegal temporary immigrants, and bail after bail of greenbacks. 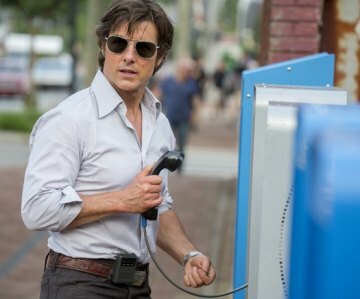 Based on a true story, "American Made" turns the enterprising TWA pilot into a secret government operative (read as entrepreneur ) who turns a near Arkansas ghost town into a blossoming real estate with a bank on every corner and (set in the 80s) lots of pay telephones side by side by side. Tip toeing over illegal activity, Cruise has a brazen 'who me' poker face, which carries much of the fun action satiric conspiracy caper tale which keeps his CIA gift twin engine full of contraband on the way to near the equator be it Columbia, El Salvador or Nicaragua and back to drop sites in the bayous and swamps of Louisiana. "Breezy, then lethal, then back again, the caustic satire “American Made” has a surreal edge. It’s a morbidly fascinating comedy, an insinuating mock documentary, and a twisted take on the American dream, audaciously masquerading as a high-caliber thriller. It’s one of the most enjoyable movies of the year." His last statement is overly hyped, but the frantic awkwardness of good guys doing bad in order to support the USA in Central America provides excellent fodder , especially not so subtle involvement of Chief Executives Carter, Reagan, Bush, and Arkansas governor Bill Clinton. Cruise's small town trophy wife, Lucy (played by Sarah Wright) gingerly accepts her hubby's new role of night flying border hopper, as long as the bags of cash keep stacking up. Despite the millions of dollars (a private bank vault just for him), no one challenges his jobs, especially since top government officials grab the phone or show up at the courthouse to prevent him from taking a fall that would trample operators all the way to the Presidency. As his business increases he hires more pilots and runs out of banks, so he's digging holes in the woods to hide cash bags and filling up closets. "American Made" has it's logic holes, but perceptive flashback narration either dumps them in the oversight hole or overwhelm with the law avoidance activities from the next caper that pulls Cruise deeper into a D.B. Cooper foxhole.